"Tender, slowly grilled spareribs are brushed with a spicy cider vinegar 'mop' while grilling. Serve with your favorite barbecue sauce." About one hour before smoking, make the dry rub. Combine chili powder, salt, garlic powder and pepper in small bowl. Set aside 2 tablespoons of dry rub. Pat ribs dry with paper towels; sprinkle both sides of each rack with the remaining rub. Set aside at room temperature for 1 hour. For the mop, whisk together vinegar, water and reserved 2 tablespoons chili rub in a bowl. Set aside. Heat charcoal or gas grill for indirect cooking at 250 to 300 degrees F. Add drained wood chips, if using. Place the ribs, meaty side down, over a drip pan and cook for 1 hour. Add about 12 coals to a charcoal grill every 45 minutes or so to maintain the heat. Continue cooking 4 1/2 to 5 1/2 hours more over indirect heat, until very tender. Brush both sides of ribs with mop mixture every 45 minutes. Add more coals as needed to maintain temperature for a charcoal grill. 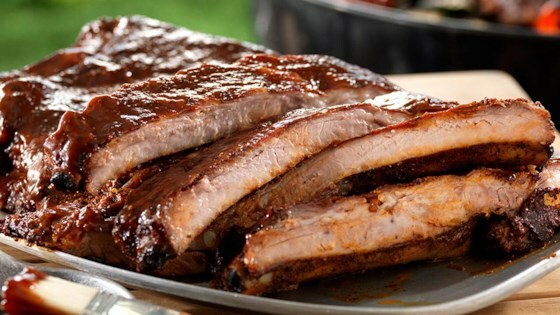 Brush ribs with barbecue sauce. Continue cooking for about 5 minutes, until the sauce is set. Turn ribs and repeat with more sauce. Recipe by BBQ Pit Master, Tuffy Stone.